I don’t know about the rest of you, but I personally have a deep rooted inquisitive nature which makes me want to know what is going on in the world around me. I have a need and a thirst for knowledge, and because I have a passion for technology, I love to see the manufacturing process behind things. One of my favorite television shows which is aired daily in the United Kingdom via satellite TV is ‘How it’s Made’ and basically goes through the full process about how everyday products are produced which is like some kind of heaven to me. Because I, like millions of other, am such a big fan of Apple products and a daily user of the iPhone and iPad, I have always wanted to be a fly on the wall in the Foxconn Chinese factories where these wonderful products are assembled. The American TV network ABC last night aired an episode of their Nightline program which showed footage from inside Apple’s Chinese factories thanks to the exclusive access they were granted. Regular presenter, Bob Weir, took his crew deep into the manufacturing plant and got to spend time not only exploring the production lines but also checking out the facilities for workings and general living conditions. In a world where a lot of products are mass produced and assembled via a complex network of machines; it may come as a surprise to many that the iPhone actually relies almost entirely on human skills and undergoes 141 human steps before it comes out the other end as a fully functional device. The video also highlights just how well oiled an operation the plant is and just how clean the manufacturing areas are within Foxconn, to the point of almost being clinical. The manufacturing personnel is made up of a large set of young workers, with none of them being over the age of 30. I am fast approaching that age myself, and whilst I can’t say I have had to work in a production line or an environment like that, it doesn’t seem like an overly terrible job to be in. I would welcome the opportunity to have first-hand experiencing making the device I love to use so much. So what other information can we extract from the Nightline report? Check out some of the numerical statistics picked out by the guys from Cult of Mac. 325 people assemble one iPad which takes five days to complete. Two shifts during one day can produce 300,000 iPad camera modules. 10,000 unibody iPad shells can be produced per hour. One individual is responsible for cleaning up to 3,000 shells by hand. Each working shift lasts twelve hours with works receiving two hour-long breaks. An average meal at the factory costs workers approximately 70 cents. Foxconn employees live in dormitories with each room housing eight people. 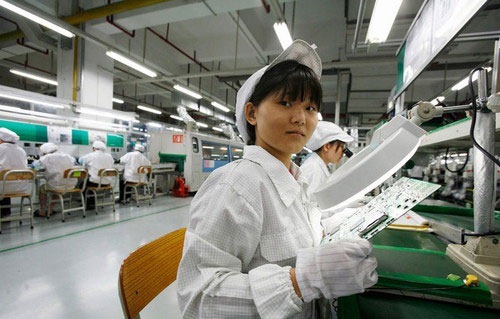 Apple have come under fire in recent weeks thanks to their partnership with Foxconn and have been criticized for allegedly ignoring the fact that working conditions at the factory are less than up to standard. Understandably, the company has hit back claiming that this is "patently false" but I am not sure that this report will paint the factory in a good light. The manufacturing side of things seems to be on par with any other factory in the United States or Europe, but to me the living conditions are certainly something I would class as below standard. Regardless of the conditions, the video paints an entirely different picture to the glitz and glamour that is associated with Apple products and is definitely worth a watch.